The Delaware County Dairy Banquet had a good crowd Saturday night to help honor those in the dairy industry. An Earlville teen was crowned the 2017 Delaware County Dairy Princess. Maquoketa Valley FFA student Amanda Engelken will hold the title for the coming year. 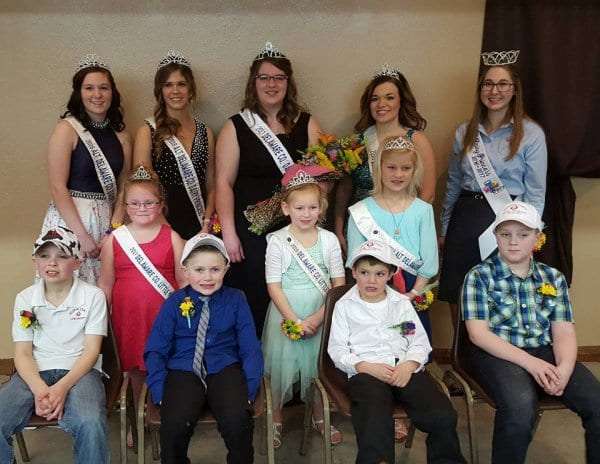 Engelken has some big goals during her reign as Delaware County Dairy Princess. Engelken will have four little ones joining her as royalty this year. Makayla Cole of Hopkinton was crowned the 2017 Little Miss Squirt. Griffin Honkomp of Earlville was named Little Mr. Herdsman, with Michael Cole of Hopkinton and Waylon Mormann of Colesburg serving as Alternates. Several awards were also presented, with the Distinguished Dairy Service Award going to Lynne Melchert. The Golden Butterknife was given to J & D Mart of New Vienna, who also catered the dinner. The Young Dairy Family Award went to Dan and Donna Hoeger and Kevin and Jill Hoeger. And it was an emotional moment Saturday night as the Distinguished Dairy Family Award was presented to the family of Jan and the late Randy Kelchen. That’s Tyler Kelchen, who says the award means a lot to his family. This year’s dairy scholarship winners were Kaleb Kruse, Troy Pasker and Ryan Goedken. And we’ll announce all the cow and herd recognition winners in today’s KMCH Ag Informer.